The following previous is based on a Beta. 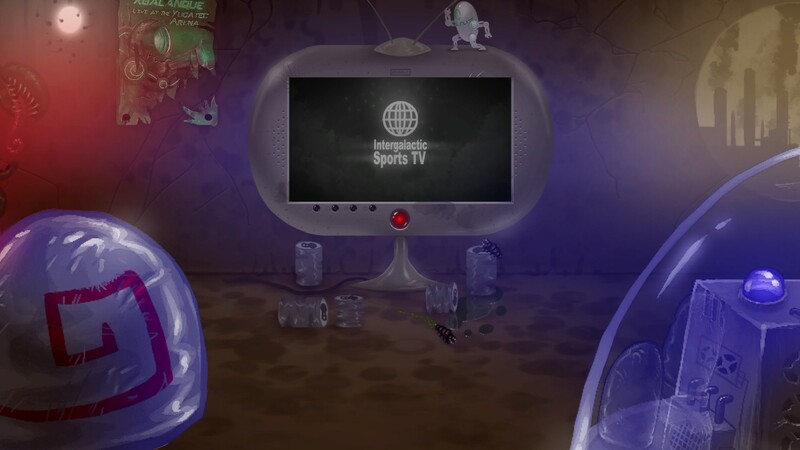 The final game may vary from what was previewed. Frequently use reviewer type people get the notion that we’ve seen it all. Every type of game there is to see, we’ve seen. Indie developers, however, seem to delight in illustrating to us the error in our ways. 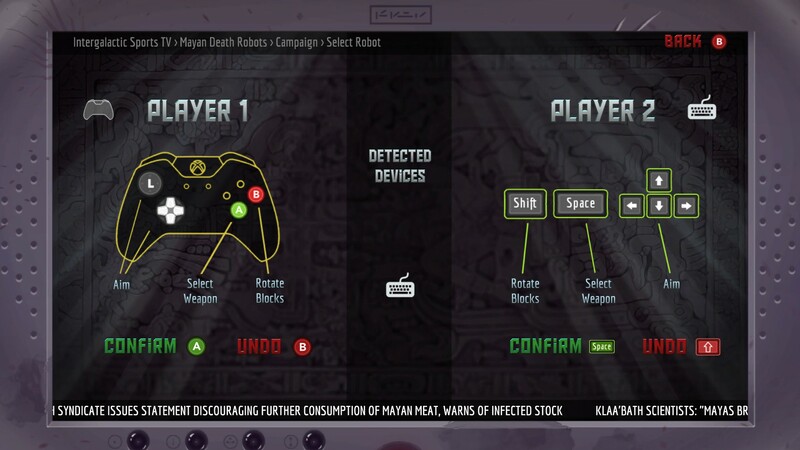 Mayan Death Robots, which burned up the floor at PAX East 2015, is just such an example. I could try to figure out how to classify it here, but really, that’s what the next section is for. The graphics in this game are fairly unique. It’s a 2D game, with the setting built out of illustrated tiles. 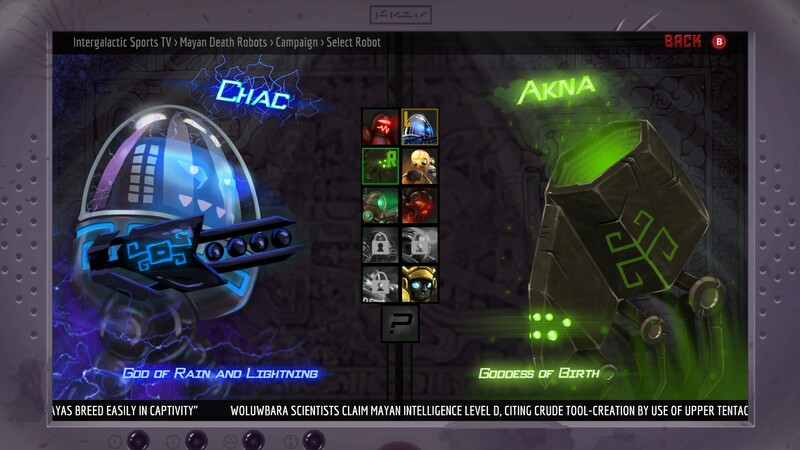 A rogues gallery of imaginatively designed players are available to you, the titular Death Robots. These range from things inspired by clunky 1950’s sci-fi robots to bizarre contraptions looking oddly like monkeys, for example. They animate in a fairly commonly seen “individual layers pivoting and squishing” method which manages to communicate a surprising amount of personality an attitude. Other elements, like the (also titular) Mayans move just by bopping about, South Park style. Here and there 3D effects show up, like ships dropping off the robots, but most of the interesting things to look at come in the forms of the attacks and their effects. Depending on the combatants in question, you’ll be seeing any number of explosive or animated attacks spamming the screen on each turn. Meanwhile, the Mayans are doing their best to build ladders to reach targets they can wail on for you, their beloved deity. Overall the presentation of the game is colorful and interesting, with a style that makes it fun to watch even if one isn’t playing. How can I describe this…? Broadly speaking it resembles “Worms.” The level is a haphazard arrangement of 2D geometry. It’s populated by little creatures running around, and attacks usually take big bites out of the scenery. 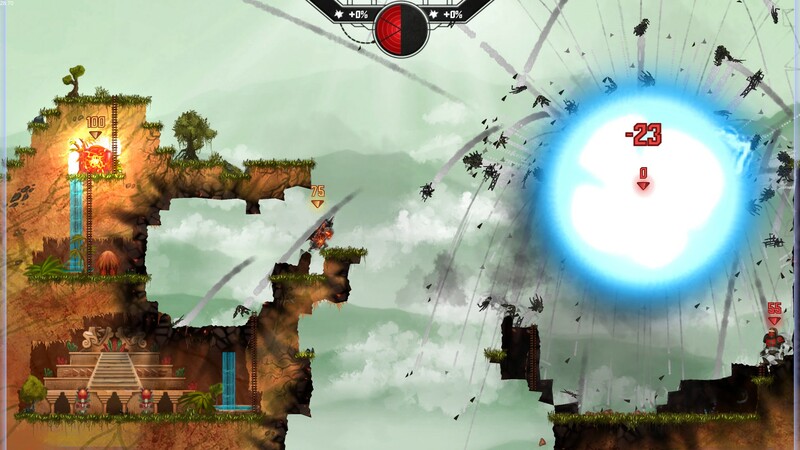 Players deploy their actions once per round, and victory is achieved with a certain level of targeted destruction. Where it differs is… well, lots of places. For one, while the little guys running around are more than willing to do damage if they get the chance, most of the offence is handled by the Death Robots. Each has a unique set of attacks, as well as the ability to jump and the ability to—get this—repair the hunks of damage done to the landscape with Tetris-style blocks. Handy, let me tell you. You’re allowed to do one action per round. Time ticks down as you select your action, then there’s a brief round where you are able to aim and react to whatever action your opponent chose. Once the timer hits zero, both sides unleash their attack/maneuver. The only difference is the construction step, which happens immediately and can apply multiple pieces depending on how many you’ve used previously. Your primary goal is to destroy the “core” protected by your opponent. You can pull this off in any number or ways. The direct approach is just to target it with your attacks. You could also construct a bridge to let your little worshipers hammer on it for you. Naturally you can attack your opponent to leave it undefended, or you can try knocking them off to get the opponent out of your hair. Now and again, the Mayan Gods will show up and complicate matters, too. They don’t like these death robots horning in on their action. It’s a two player game, and I did my playing in the same room, with one of us manning an Xbox controller and the other on mouse and keyboard. All things considered I preferred the gamepad for controls. Fun little music that matches the attitude of the visuals, plus lots of explosions. That’s what you get. What else do you need? 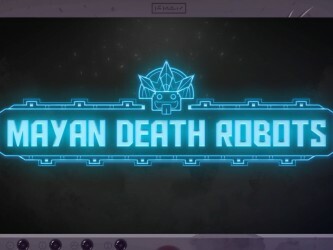 The story of this game is that Earth (during the height of the Mayan Empire) is the arena in which the most popular galactic TV show is being filmed, battles between giant death robots. You’re a new player, competing for standings in this exciting sport. Zany enough for you? This is a fun party game, plain and simple. The ability to move, attack, and construct leaves room for a great deal of strategy. 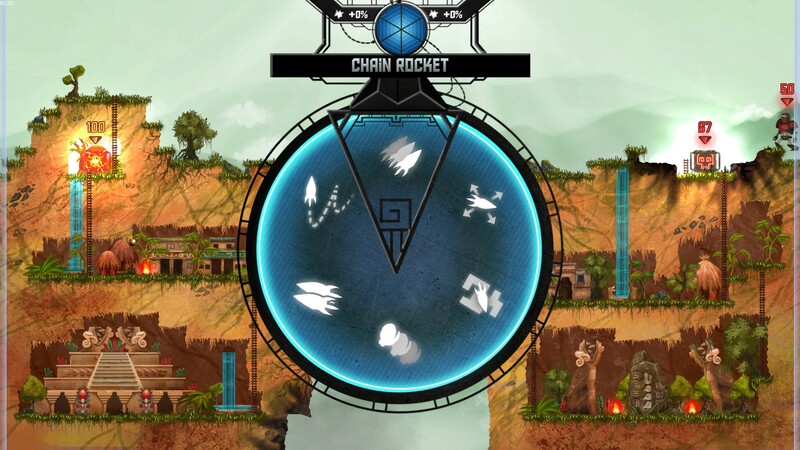 While the randomness of Mayan God attacks and random bonus weapons leaves it anyone’s game from beginning to end. When I played it, there was no AI yet, so it was just PvP, but honestly, I think that’s how the game ought to be played. I really recommend you check this one out and spend some time blasting your buddies. A good time had by all, but a better time had by the winner.